When it comes to customizing your Dyna Low Rider motorcycle, there is no substitute for quality and durability. We understand that your bike is your lifeline, and some products simply don't make the cut. That's why we feature an amazing collection from Viking Bags, combining elegance, excellent construction and affordable pricing into one luggage set. Because we offer such a vast range of options for riders, there's something for every kind of rider, new and old. 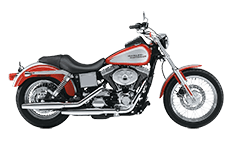 Check out our online catalog of Dyna Low Rider saddlebags, or give us a call with your questions. Unrivaled Durability.